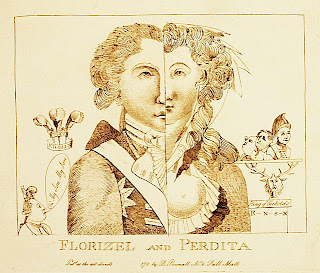 As Ms. Davenport points out, this was not Shakespeare’s Winter’s Tale, but an adaptation by David Garrick, known as Florizel and Perdita, in which Perdita is a sweet and charming maiden. The Prince sent Mary notes addressed to Perdita and signed them Florizel, as though they were the characters in the play. So began his first publicly known affair, the first of many. Mary was born Mary Darby in Bristol in November of 1757 or perhaps 1758, which made her a few years older than the prince (b. 1762). 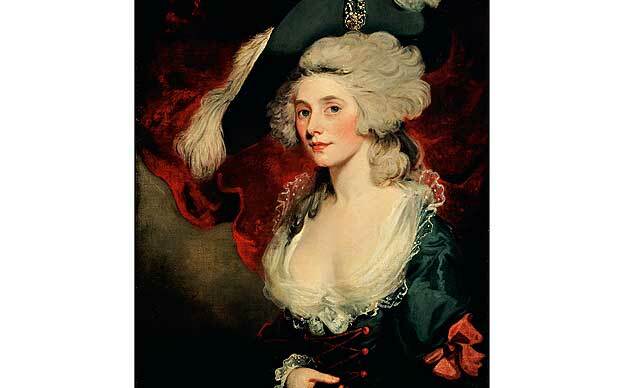 Her “disastrous” marriage at age 16 to Thomas Robinson brought her a daughter, Maria Elizabeth (b. 1774), but little financial or emotional support. Eventually, she began to perform on the London stage, often in “trouser roles,” playing young men and displaying her fine figure for all to admire. Though Prince George did not remain faithful to her for long, Mary was known as Perdita all her life. While she enjoyed the Prince’s attentions, she was the toast of London, extolled and excoriated in the newspapers, the object of considerable gossip in noble salons, especially among the males. By the time the fanciful caricature above was published in 1783, the relationship was “quite out of date.” When the Prince quite publicly took up with other females, Mary refused to send back all his letters and other tokens of his fickle adoration. Later she received a not-so-secret payment in exchange for the return of some of them. 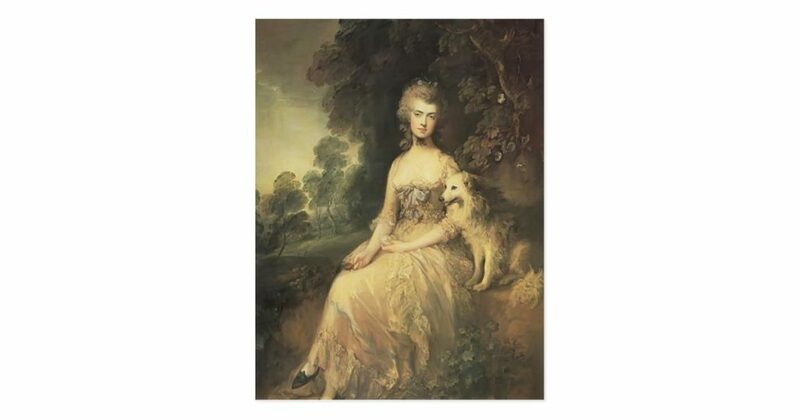 In 1781, Mary sat for a portrait by Thomas Gainsborough, commissioned by the Prince. In this version of the painting in the Wallace Collection above (another is in the Royal Collection), Mary holds a miniature of the Prince in her right hand. Mary had only a brief time in the limelight of the London demi-monde. Only a few year later, she was reported to be “desperately ill.” Various explanations for her condition have been suggested, but the causes of her maladies remain mysterious. In May of 1791, she published a book of poems, “a small but handsomely bound volume with marbeled end papers,” made possible by sums raised by 600 subscribers, including the Prince of Wales, the Duke of York, the Duke of Clarence and many other luminaries. 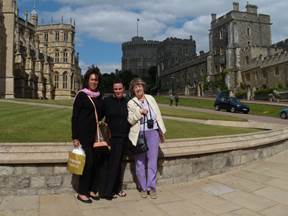 In 2010, Kristine and Victoria, along with Kristine’s daughter, Brooke, visited with Hester Davenport in Windsor, here at the Castle. Hester Davenport chronicles the reception Mary’s book received. 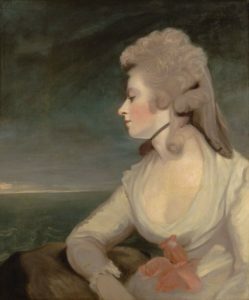 Readers seem to ask, “How was it possible to connect the frivolous woman of 1780s gossip with a writer of pensive odes, elegies and sonnets?” That Mary acquired the title ‘The English Sappho,’ possibly at her own instigation, may have added to the this (seductive) sense of being wooed. Mary lived only a few more years, dying in 1800, having never recovered her health. She had, however, continued to write poetry as well as her memoirs, several novels, plays and feminist essays. As an endorsement of the value of her literary work, the painting of Mary Robinson by Hoppner, above, was acquired for the Chawton House Library, where it is displayed prominently. Many works by Mary Robinson are available from their website. Her biography is here. Note: Victoria, Jo Manning and Kristine lost their dear friend Hester Davenport in September 2013. We like to think that she and Perdita are together, drinking tea and catching up on two centuries worth of gossip. How many times has Hester Davenport’s name passed my lips since we lost her on September 23rd, 2013 – five years ago? Too many to count, as we at Number One London have so many memories of our beloved friend, sharing them often. If we’re not speaking of Hester amongst ourselves – Kristine, Victoria and Jo Manning – we’re sharing stories of Hester with other friends and acquaintances. She is never far from our hearts. Victoria, here. I find it difficult to express my sense of loss at the news of Hester’s passing. We will miss her terribly. Wherever she is, I am sure she is organizing everything with her gentle touch and genial good humor. Kristine and I (and Kristine’s daughter Brooke) thrust ourselves upon Hester one day in June, 2010, full of excitement for our upcoming trip to see the reenactment at the 195th anniversary of the Battle of Waterloo. She had invited us to spend the day with her at Windsor, but little were we prepared for the depth of her welcome and her plans for our visit. 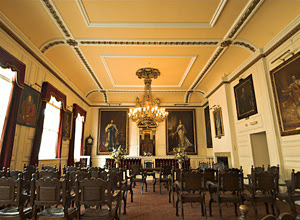 We started at the Windsor Guildhall, where she showed us around the upper floors. Then we went into the lower level where the archives were in the process of being moved to make way for the new museum that Hester masterminded. 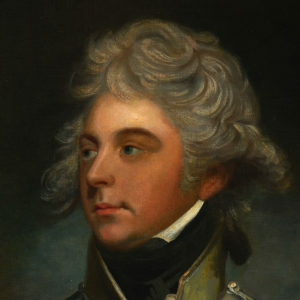 Hester thoroughly charmed and surprised us by showing us the accounts of the news of the Waterloo victory as they were received and celebrated, as reported in the Windsor and Eton Express. The original newspapers had been bookmarked for us and there probably had never been two more thrilled readers of the Windsor Gazette than Kristine and I were. We read about how and when the news was received and the celebratory plans for the royal family and the community. It was such a thoughtful thing for Hester to do, and greatly added to our enjoyment of our Waterloo visit. 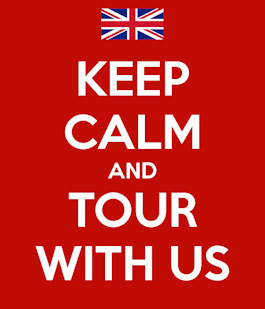 After giving us the latest 195-year-old news, Hester asked us if we’d like to go see the Queen. That is a QUESTION??? We jumped at the chance. Off we hiked to the drive from the Castle up the long walk toward Ascot. Hester told us that the royals went most of the way in autos then changed to open carriages to enter the race course. A small group had gathered to await the parade of black limos, and we had a glimpse of Herself as she passed by. We went on to lunch in a quaint cobbled street-café, all the while chattering a mile a minute, telling each other about various projects underway, observing the locals and tourists, and basking in Hester’s erudite presence. Of course we talked about the royals, Waterloo, the new Museum about to be created in the Guildhall, then on to persons of interest to all of us, celebrities such as Mary Robinson, Fanny Burney, Mrs. Delaney, Dr. Johnson, and Queen Victoria (and Prince Albert). Exactly the kind of celebrity small talk everyone enjoys, right? Well, at least those of us who indulge in the fantasy of living in the 18th and 19th centuries. Eventually we moseyed off to the Castle and did the tour. 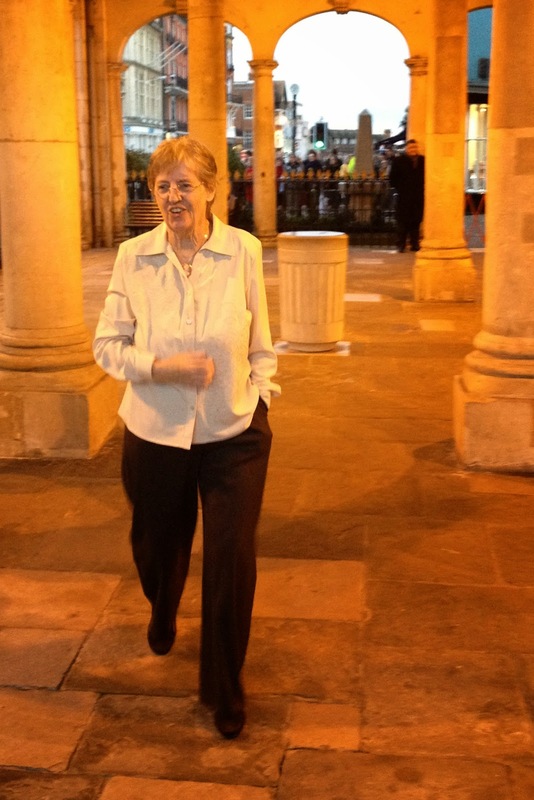 We were certain Hester had walked that route a million times but she gallantly assured us she loved it every time. Every step of the way, she told us “inside” stories, all about the fire in 1992 and what was restored. And how! 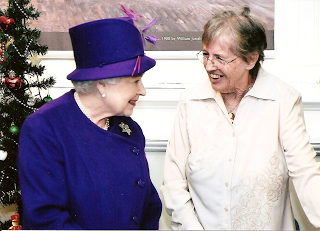 On other visits to Windsor, Hester showed us all around the new museum, where she had also welcomed Her Majesty (see below). She always had the most interesting details to impart without in any way taking credit for all the things she had accomplished. 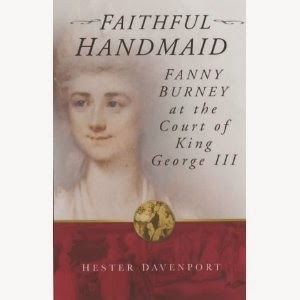 As head of Dr. Johnson’s House, as an excellent biographer, and as the head of the Frances Burney Society (in addition to many other endeavors and awards), Hester had a role in the most esteemed of British scholarly organizations. But she always had time to chat with amateurs like us. So we will greatly miss a wonderful friend and favorite companion. 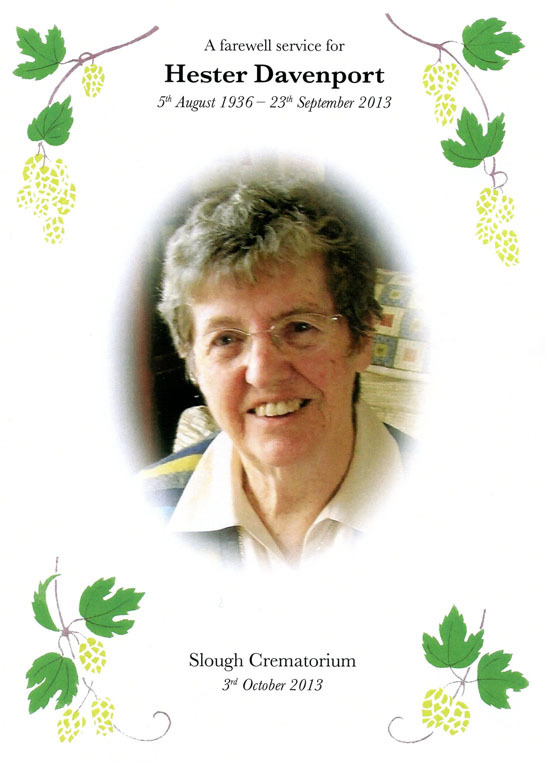 All our best to her dear husband, Tony, gardener extraordinaire, and to their daughters. RIP, Hester. Kristine here, still unable to process the fact that Hester is gone. Hester and Windsor will forever be linked in my heart. So many memories and so many good times, most arranged by Hester, who was a respected historian, accomplished writer and also very funny. Below is a photo taken by Victoria of Hester and I looking at the grave of Mary Robinson in Windsor, which Hester tended faithfully. You won’t believe me, but on several occasions Hester related the funniest stories about Mary’s grave to Jo, Victoria and myself. I think my favorite was the time that Hester was showing a group Mary’s grave and while she was giving her talk, became distracted by the fact that Mary’s grave boasted several fresh sprays of flowers. Who could have left them? Where had they come from? 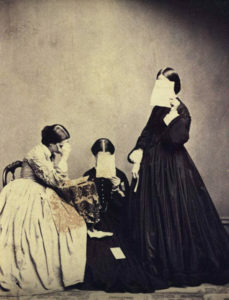 It wasn’t till she’d finished that Hester realized she’d taken the group to the wrong grave. 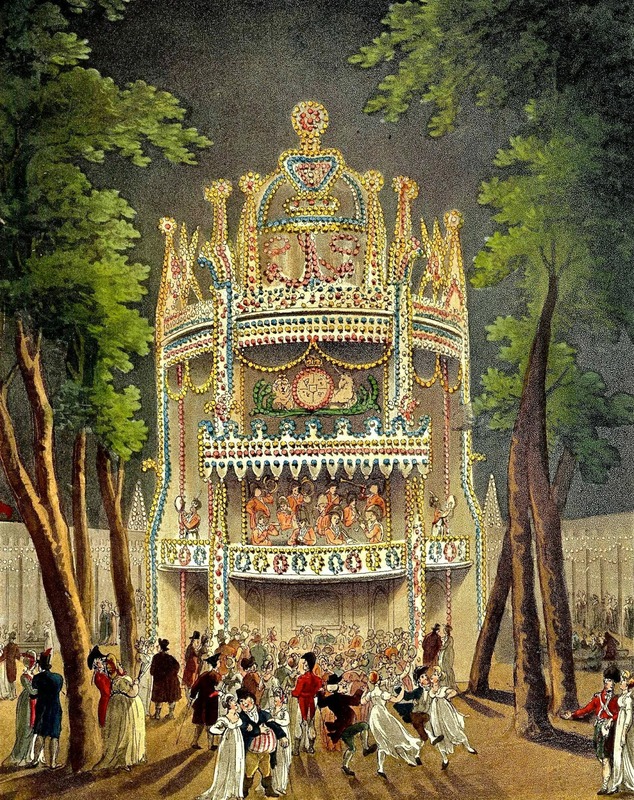 I remember the email we received from Hester telling us that she was doing a truly daring thing – bidding on an original print of Rowlandson’s Vauxhall Pleasure Gardens, above. A broker would be phoning in her bids during the live auction. We girls kept our fingers crossed across the pond and were dead chuffed to learn that Hester had submitted the winning bid. Next time I was over, of course I saw the print up close and in person. What a treat. Hester was instrumental in the founding of the Guildhall Museum and was appointed to welcome Her Majesty and take her around the exhibits when the Museum first opened. 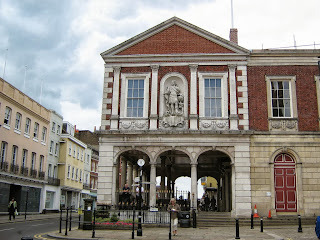 Of course, the Guildhall figures largely in my memories of Hester. And the Queen. 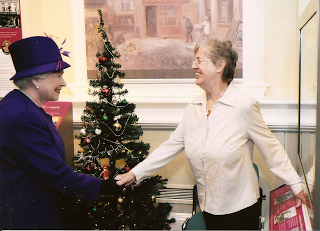 Hester and the Queen – could anything be more perfect? As most of you know, Hubby and I recently spent two fabulous days with Hester when we were over in January. Firstly, Hester drove us to Oatlands, now a hotel, but once the home of Frederica, Duchess of York. The three of us had tea and then Hester helped me to search the grounds and find Freddy’s pet cemetery. Below is a photo of Hubby, Hester and some guy they picked up at Hampton Court, where we went afterwards. 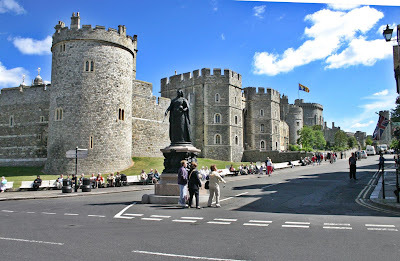 Next day, Hester and I toured the kitchens at Windsor Castle together, had lunch and took a stroll by the river. 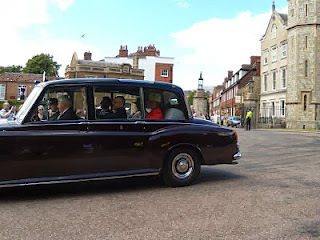 Hester was to have spoken to our group when Victoria and I go over to Windsor in September 2014 for the Wellington Tour. How everyone in our group would have enjoyed meeting Hester – and how much fun we’d have had. I am convinced that Hester is now spending her days in a well appointed drawing room with the likes of Brummell, Fanny Burney, Mrs. Fitzherbert, the Duke of Wellington and the Duchess of York. I only pray that she’s keeping my seat warm. The last time I saw my dear friend and colleague Hester Davenport was when I waved goodbye to her as she drove back to Old Windsor after dropping me off at the railroad station in Windsor. It had been a glorious day, but all days with Hester were glorious, despite the often mercurial English weather. We’d had tea and pastries – the biscuits a culinary treat – in the back garden with her husband Tony, enjoying the spring flowers and exquisite green swathe of lawn. I was sorry to have to leave, as I always was, because good company is rare anywhere in the world and theirs was sublime. Hester, after her long and arduous string of medical treatments, looked so well! And she was chipper, too, looking forward to her next adventures in writing and editing. She was skilled in both, such a talent. Her prose was smooth and readable, eminently so. 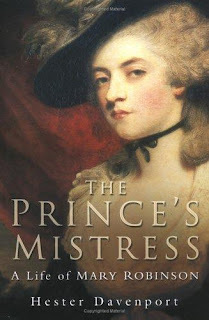 We “met” online in 2005, when my publisher forwarded to me Hester’s comments on the biography I wrote on the 18th-century courtesan and memoirist Grace Dalrymple Elliott. It’s a small world: Hester had recently completed a well-researched, beautifully-written biography of Grace Elliott’s rival in love – or what passed for it in the Georgian era amongst the aristocrats and royals – Mary Robinson aka Perdita. Hester’s remarks about my writing were so very kind…and thoughtful. She took issue with some interpretations I’d made but acknowledged that so much of the conclusions we drew concerning the lives of these ladies were interpretive, at best. We loved our subjects, those so-called soiled doves so ill-used by wealthy and powerful men…tough women who sometimes triumphed over social adversity but most times did not. We were thoroughly engrossed in our research and subject matter and it was so delightful to find each other…someone to talk with and reflect and whose company was thoroughly enjoyable. Yes, we most assuredly would have bored the trousers off the majority of people with what we talked about, so being together was a treat beyond the ken of most. We also bonded over biographers who came after us and used our research, claiming it to be their own. We each had a specific bête-noire! We actually met face-to-face in early 2006, over a delicious meal and white wine at the restaurant atop the National Portrait Gallery. The talking was even more delicious than what we ate or drank Hester was witty…and wise…and a wonderful companion. A highlight of our day at Windsor was our side visit to St George’s Chapel, where Hester thoroughly scandalized the docents — and delighted me and the girls – by stomping fiercely on the earthly remains of King Henry VIII, an historical character we found revolting to the max. I will never forget that scene. I miss her. I will always miss her, although I continue to have an ongoing dialogue with her in my mind. I truly believe that people are only really gone when you forget them, when memories disappear. I will never forget my kind, wise, wonderful, clever, witty, darling friend Hester Davenport…and I will bless her memory so long as I live. 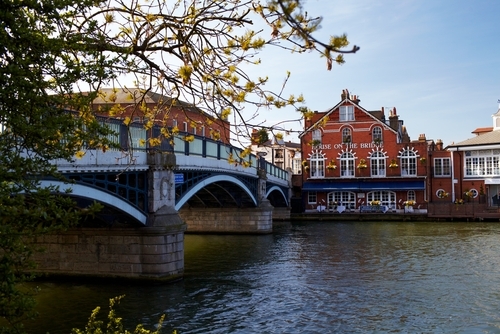 After leaving the Guildhall, Hester and I took a leisurely stroll down to the Thames and stood on the bridge. “One day I’m going to come back and take the boat ride,” I sighed. “You’ve never done the boat?” Hester asked. So off we went and found ourselves a nearby restaurant, where we ordered tomato basil soup accompanied by warm bread with lashings of butter and two lattes. I can’t recall exactly what Hester and I discussed over the meal, though it had something to do with conducting research at the Royal Archives, the families (ours, rather than Royal) and other odds and ends. Afterwards, we made our way to the Castle. We arrived early enough for us to visit the gift shop. 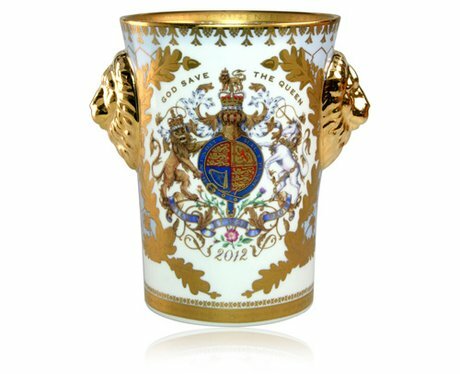 I was on the hunt for a Golden Jubilee item to add to my collection and there wasn’t a shortage of items on offer. Which should I choose? Hhhmmmm. Before I could decide, it was time for the Kitchen Tour, so Hester and I made our way over to the meeting point. 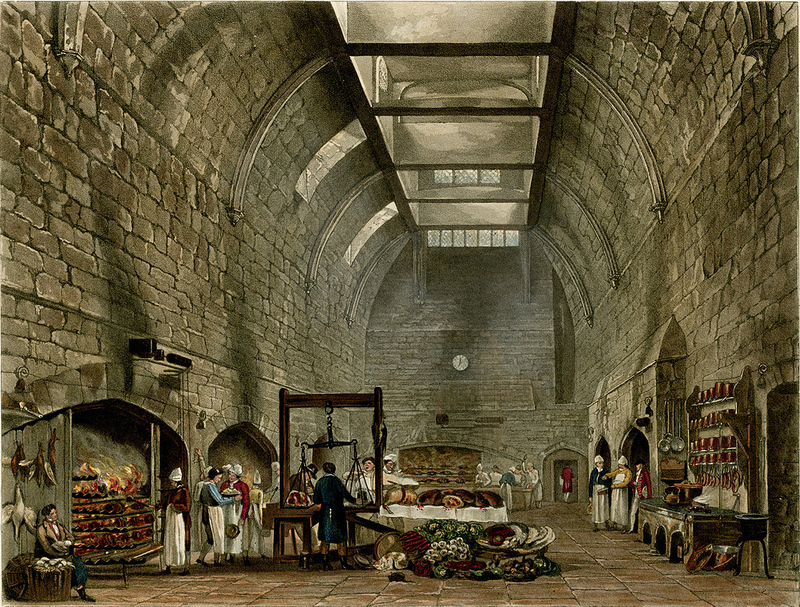 Above is a rendering of the vast Windsor Castle kitchen in late Georgian days. 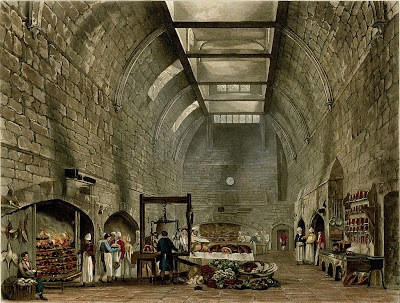 The present day kitchen tour “takes you behind the scenes to the oldest working kitchen in the country, in constant use for nearly 750 years. Today, staff of the Royal Household use the Great Kitchen to prepare food for both grand ceremonial occasions, such as State Banquets, and more informal events in the royal diary. 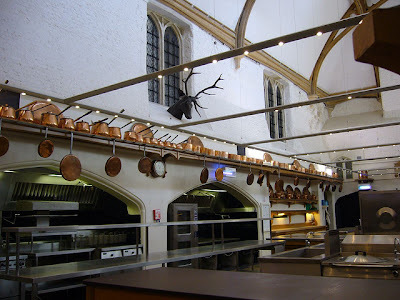 Your guide will tell you about the devastating fire of 1992 and how restoration work uncovered the Great Kitchen’s original medieval structure. 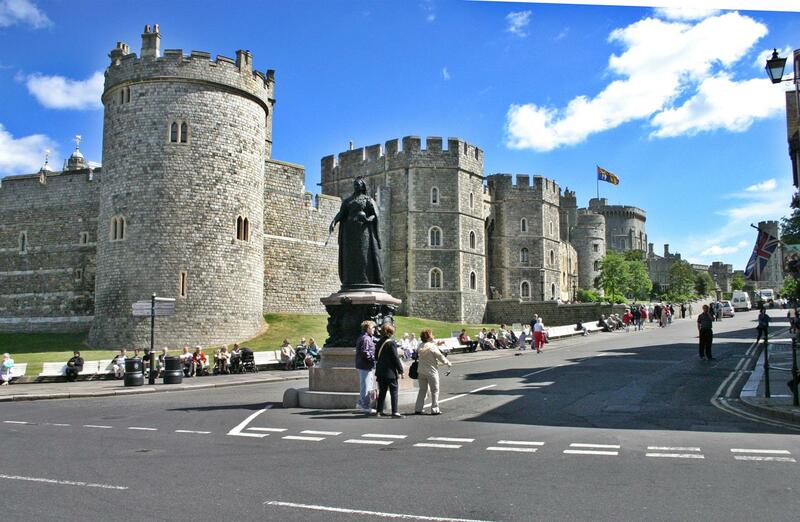 You will hear about royal dining, past and present, and have a fascinating insight into Windsor Castle as a working royal palace.” In addition, the tour includes the State Entrance and the medieval Undercroft, areas not normally open to the public. 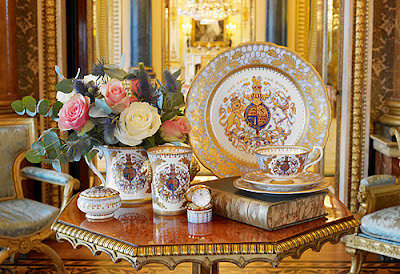 The copper cookware you see in the photo above all bear the cypher of King George IV and the cast iron stoves installed by Prince Albert are still in place, though now rarely used. The kitchens were deserted when we tour them, the photo below being one I swiped off the internet, as photography was not allowed. As stated above, the tour also included halls and passages that are rarely on show, so that we found ourselves walking through stone corridors that appeared untouched since at least the Georgian era. It was a rare insight into this magnificent building. After the tour, we returned to the gift shop, where I finally made up my mind and purchased the Jubilee beaker above. It now holds pride of place on my living room mantle. The Final Installment In This Series Coming Soon! After Hampton Court Palace, Hubby and I went back to the Castle Hotel and rested for a while before venturing out again for dinner. 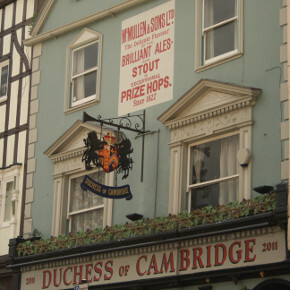 This time, we ventured a whole two blocks away, just down the High Street to the Duchess of Cambridge pub. Soon after we’d sat down, I realized that the three blokes at the next table were ardently discussing Downton Abbey. I tried to eavesdrop, naturally, but it was hard to decipher every word and, besides, I was distracted by the Duchess of Cambridge. The Duchess of Cambridge who? I wracked my brain for an historical Duchess of Cambridge who’d rank pub name status. In Windsor, no less. Which Duchess of Cambridge had ties to Windsor? Princess Augusta, who’d married Prinny’s brother, the Duke of Cambridge? Hadn’t they spent a good portion of their time in Hanover, rather than England? And his son, George, had married an actress, whose existence was ignored by the entire Royal Family and she’d been denied the title HRH, anyway. And upon George’s death, the title became extinct until it was bestowed upon the present Prince William. Hhhmmmm . . . .
“You were off in a cloud. What are you thinking about?” Hubby asked. Our waiter approached to take our orders. “Can you tell me which Duchess of Cambridge the pub is named for?” I asked. 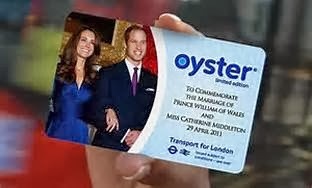 “Er, Kate Middleton?” he answered. Ah, now I felt better, although slightly tricked. After dinner, we made an early night of it and the next day I met Hester at the Guildhall for a private, guided tour of the Museum – where Hester got to meet the Queen. 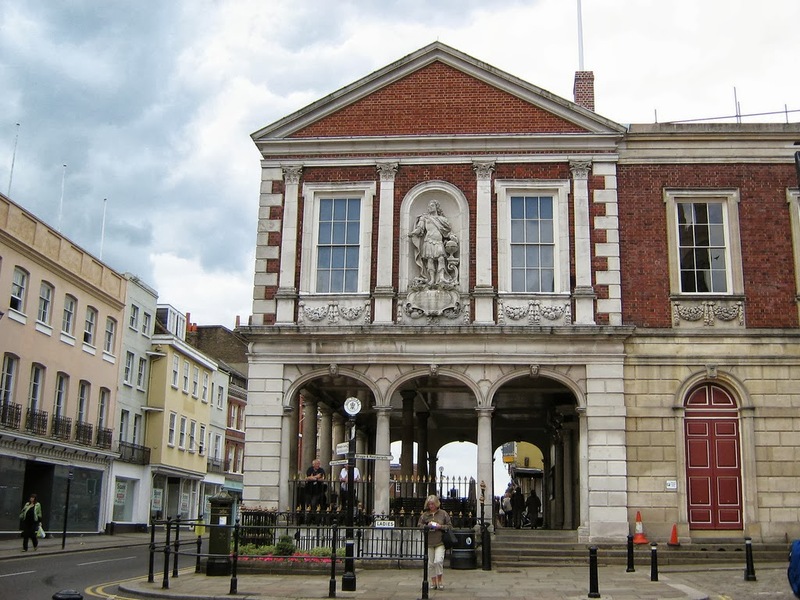 The present Guildhall replaced an older cornmarket and was built in the late 17th century and is often associated with Christopher Wren, although there’s no evidence of this. The Museum itself is housed in a 19th century extension and serves to display items of local history. 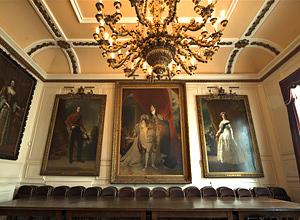 Upstairs, royal portraits adorn the walls, including one of himself given by Prinny which was so large the council had to take a window out to fit it in. Also upstairs is the room where Prince Charles married Camilla – dubbed by myself as “the scene of the crime.” The room contains several stained glass windows and more portraits, including a grim one of Queen Victoria and a rather nice one of the present Queen when young. Here’s Hester standing in the very room where, by the way, Elton John was also married. 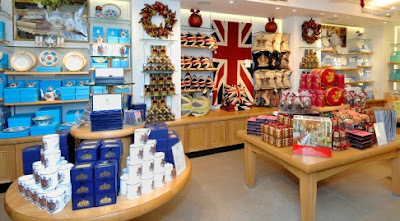 To the left in the picture above can be seen one of the new Diamond Jubilee windows, showing Balmoral Castle. Upon leaving Oatlands, Hester, Hubby and myself set off for Hampton Court Palace. I had never been before and therefore felt that I should rectify that. 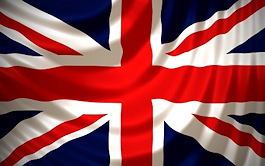 Now I’ll come clean and tell you that I have relatively no interest in British history prior to roughly 1750. Henry VIII interests me not at all and anything earlier than that is off my historical radar. I have two great friends who write Scottish medieval romances – Sue Ellen Welfonder and the late Arnette Lamb. I’ve posed the same question to them both – why? What is remotely romantic about unwashed men with unkempt beards who wear skirts and sport dirt under their fingernails? Neither have ever given me a reason that satisfied. Now don’t get me wrong, in the typical course of things I’m up for visiting medieval, Tudor and Restoration sites, but I’m more interested in their history and occupants during the Georgian, Regency and Victorian eras. 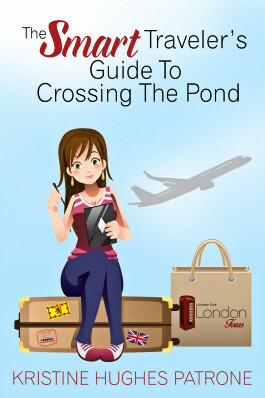 So when I went to Hampton Court Palace, my mission was to find Grace and Favour Apartment No. 9, where the Duke of Wellington’s sister, Lady Anne, once lived. I mentioned this to Hester and Hubby when we arrived at the Palace. An ice skating rink had been set up near the entrance, so we stopped for a few minutes to watch the skaters. And then we passed over the moat on our way through the entrance. And found ourselves in a courtyard, where we couldn’t help but notice the painted wooden figures scattered about. The one below seems to be napping. And the figure above made room for Hester and Hubby to sit beside him. Too bad there wasn’t actually anything to drink in the jug he was holding. If you know the story behind these figures, do let me know. A Google search has turned up nothing so far. After taking note of the interesting chimney pots above, we crossed over the courtyard and into the visitor’s centre, where we paid our entry fee and Hester asked the nice lady on duty if she knew the location of Apartment 9. She said she didn’t, but that we should ask one of the Warders inside. We thanked him and moved on – before realizing that we hadn’t asked where the Georgian Rooms are. So we traversed more halls and large, empty rooms. By this time, Hubby was decidedly fading. “Oh, dear,” said Hester, after getting a good look at his pale and clammy face. “Maybe you should sit down,” she suggested. “If there was a chair in sight, I’d take you up on that,” Hubby replied. . Finally, we found another Warder. “Ian?” we all asked in hopeful unison. We climbed up another set of stone stairs, with Hubby flagging behind us. Finally we arrived a room that actually had furniture in it. And a bed. I had to physically restrain Hubby from lying down upon it. And there was another Warder. “Ian?” This one shook his head and pointed down a long and empty corridor. Sigh. Down the hallway we all trudged until it opened into a panelled and painting lined room. In it stood another Warder. Hester and I could have kissed him. Hubby collapsed onto a wide window ledge. We told Ian all about our search for him and how we’d traipsed high and low searching for him, as we’d been told that he’d know all about the Duke of Wellington, Lady Anne and Apartment 9. We exchanged email addresses and Ian, Hester and I began discussing the Regency and early Victorian history of Hampton Court. Turns out that Ian was, indeed, a font of knowledge. I can’t tell you off hand all we discussed, but the conversation didn’t flag for a moment and it went on for ages. After a while, I thought to check on Hubby. So off we went, following a map that Ian was kind enough to draw for us. We walked the gravel paths and marveled at the sculpted trees until, miracle or miracles, we found the entrance to the apartment where Lady Mornington once lived, pictured below, exactly as described to us by Ian. Apparently, Lady Mornington kept a garden of some note behind these green gates. I contented myself with the fact that we’d at least found the spot and took pity upon Hubby by suggesting that we head back to Windsor, and our hotel room. “Oooh, I’m looking forward to that,” she replied. “Kitchens? 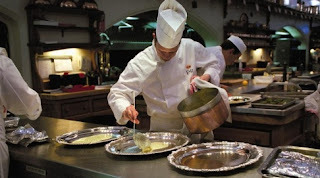 A tour of kitchens? I don’t have to go, do I?” asked Hubby.